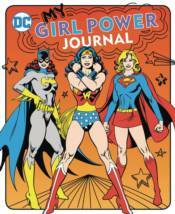 My Girl Power Journal is filled with fun prompts that will encourage girls to write, draw, create, contemplate, and grow strong in the process. From "What makes me feel strong?" to "Who would I choose as a sidekick?" to exploring how an entertaining range of superpowers (mind-reading, X-ray vision, super-speed) would play out in real life, the questions in this unique and empowering journal make it a terrific tool for girls 8 and up. Girls are encouraged to imagine what the world would look like if they were in charge; to think about the things they are proud of; to focus on the times they overcame their fears or failures; and to plan their future as the super hero they will surely become.